This eye-opening personal history tells the story of an American college professor’s twenty-year engagement with a thriving Africa rarely encountered by Western visitors, including an extraordinary connection to poets across the continent. 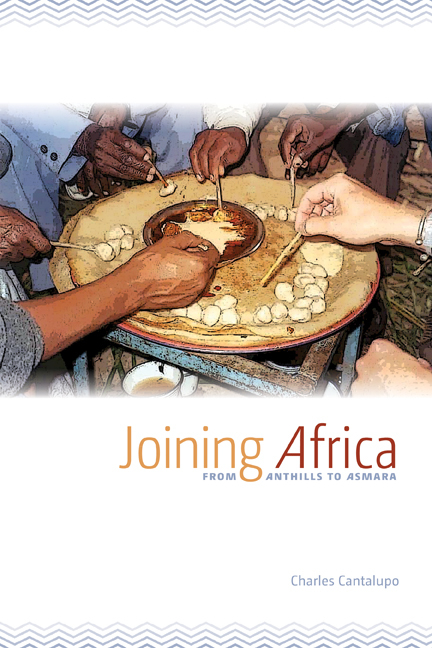 At once adventurous, spiritual, political, dreamlike, and humorous, Joining Africa is a unique documentary of a journey through the continent, including an intense five-year encounter with economically struggling but culturally fertile Eritrea. The Africa presented here is neither a postcolonial study nor an exotic tourist destination. It is rich with the voices of its people, whose languages, Cantalupo argues, have greater potential to effect change than any NGO or high-profile celebrity. In vibrant prose, Cantalupo’s book extends a stirring invitation to reevaluate how we engage—both individually and collectively—with this remarkable part of the world. Charles Cantalupo is Distinguished Professor of English, Comparative Literature, and African Studies at Penn State University, Schuylkill. "Joining Africa is the expansive, expressive, and arresting story of one man’s journey into the heart and soul of the African poetry tradition. Cantalupo opens the way into a world few of us will ever visit, bringing the beauty, pain, and power of language fully alive on the page." "This is a beautiful and moving account of how an 'American white guy' from Orange, New Jersey, got wrapped up in Africa and became the public voice of the once invisible literature of Eritrea. It is an unforgettable account of the other Africa—a place of hope, of longing, and redemption." "Every artist inevitably comes up against—and then must triumph over—his most abject and revelatory moments. Charles Cantalupo has done it in Joining Africa. All-encompassing, all-embracing, and capacious, this is his Gesamtkunstwerk, an obsessive, retrospective journey that builds upon the author's lifelong ethnographic and literary preoccupations. The book literally stands for what the author believes in, and grateful readers revel in the gift."